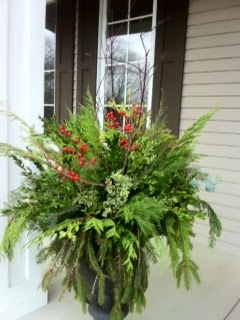 Just as I am getting into the swing of holiday pots the “biting” cold has hit! 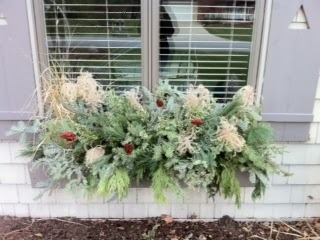 It’s only Nov 12 and I already came across some very frozen window boxes that I had to give up on. Not good! 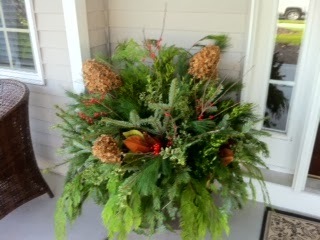 I know of someone who does holiday pots in Minnesota and she finished all of her jobs last week. She was smart. I wish could say that about myself! If you are interested, here’s a link to my Winter Album with pictures from previous years. If the cold weather continues, I may not be adding many new pictures to the album this year! You might not hear from me in awhile because I’ll be frozen for the next 3 weeks!